Just before Christmas last year, a new teaser debuted promising the release of the fantasy comedy Knights of Badassdom. The long delay of the film will likely only be a benefit since Peter Dinklage has a much high profile now thanks to "Game of Thrones." But what's not helping is this disaster of a poster trying to hype people up for the film hitting limited theaters on January 21st and VOD next month. It's symmetrical, which is fine, but the rest of the shoddy Photoshop job with characters cropped and pasted onto fire is lazy, fitting right in with that video about the deteriorating quality of movie posters we just tossed up. Look now! 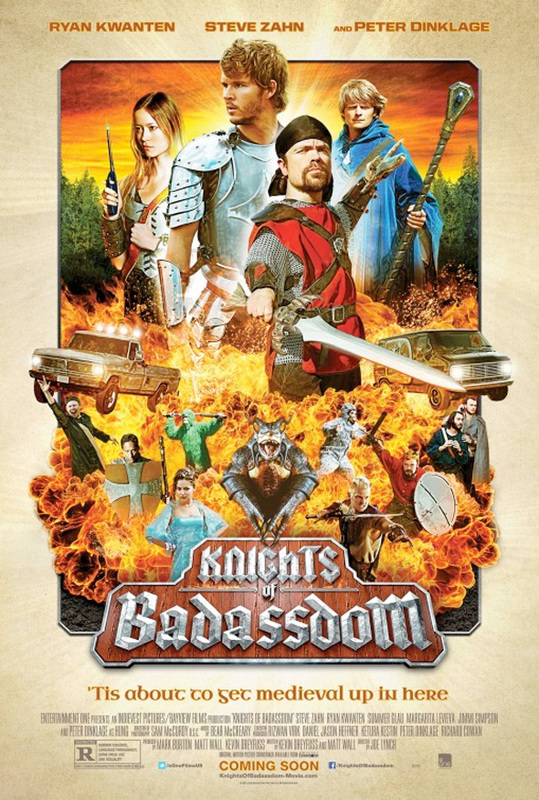 Knights of Badassdom directed by up-and-coming American indie filmmaker Joe Lynch (@TheJoeLynch on Twitter), who previously has only directed Wrong Turn 2: Dead End. The screenplay was written by first-time screenwriters Matt Wall & Kevin Dreyfuss and follows a group of LARPers (Live Action Role Players) who inadvertently summon a deadly succubus during the middle of a big fantasy battle and must fight her in the real world. Ryan Kwanten, Peter Dinklage, Summer Glau, Steve Zahn, Danny Pudi and Margarita Levieva star in the film which eOne will release in theaters via TUGG on January 21st, followed by a VOD release on February 11th. You can read our coverage of the Comic-Con panel here. Excited? one could also interpret it as intentionally (and appropriately) kitsch since the movie is an over-the-top comedy. Not so bad, reminds me of the old Atari game covers. This movie has reached the point of badness that it's becoming a must see...when you have the time and nothing else to watch...on TBS...or Comedy Central. Speaking about cheap Photoshop job, I made my own lil' fan made poster for Knights of Badassdom a few years ago. It was even shown on IMDB page until the producers (I guess) had it removed. And a hebrew-ized version of my poster was used at the premiere of the movie at Icon festival in Israel in Sept. 2013. I agree with some of the comments. It looks so bad I must see it! Why isn't Summer Glau's name name not on top of the poster? I was also asking myself that question!